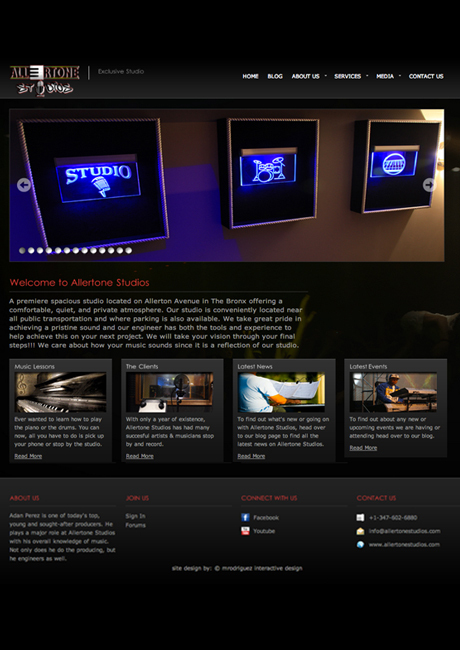 Allertone Studios is a premiere, spacious studio located on Allerton Avenue in The Bronx they offer a comfortable, quiet, and private atmosphere. They needed a website that would showcase their services and bring in more clientele.They now have all that and more. The site has an added gallery for their rehearsal pictures and concert videos, a Word Press Blog to communicate with their clients and fans, and a page for additional services that include renting a private space for functions. I will continue to help with future updates and/or maintenance.